Bob Sinskey was an ophthalmologist practicing in Santa Monica when I was an ophthalmology resident at UCLA back in the early 1970s. We operated together several times. He went on to indulge his passion for wine by first owning Acacia and then starting his own eponymous winery which is now located in Napa Valley. 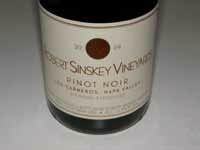 From a humble beginning of 15 acres of vineyard land, Robert Sinskey Vineyards has grown to just under 200 acres of prime vineyard land in five Napa Carneros locations and a small 4.8-acre estate vineyard adjacent the winery in the Stags Leap District of the Napa Valley. All the vineyards are certified organic and are farmed biodynamically. His son, Rob, initially took over the winery management while Jeff Virnig was hired as an apprentice winemaker in 1988. Jeff became the full-time winemaker in charge of winemaking in, Jeff. 1991. Jeff has a degree in agriculture from Cal Poly San Luis Obispo, and has championed the Los Carneros region of Napa Valley. He is known to be very dedicated and extremely diligent in his craft. 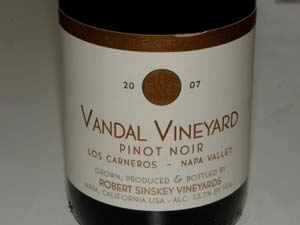 Stylistically, the Pinot Noirs are relatively low in alcohol, elegant, with minimal oak encumbrance. They are definitely not of the Caliesque mold of high extraction, ripe fruit, and generous alcohol. 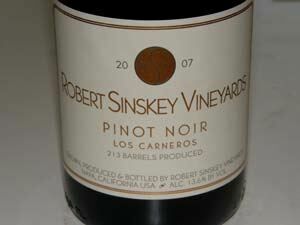 Pinot Noir has been produced since 1986. The Pinot Noir lineup: Los Carneros Pinot Noir, Three Amigos Vineyard Los Carneros, Vandal Vineyard Los Carneros, Capa Vineyard Los Carneros, and a Reserve labeled Four Vineyards Los Carneros. 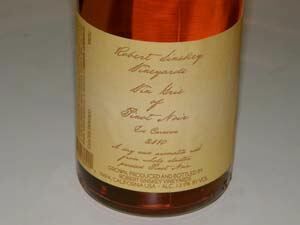 The winery's rosé is particularly notable. It has a clean, crisp, refreshingly dry palate with floral and strawberry notes. Sourced from OSR, 3 Amigos and Scintilla Sonoma vineyards, it is 100% certified organically grown and biodynamically farmed. The wine is so popular that it is typically bottled in January and sold out by June. The tasting room at 6320 Silverado Trail in Napa is open daily from 10:00 to 4:00. The wines are also sold online. Visit the informative website's Vineyard Kitchen which includes seasonal menus and recipes from Maria Helm Sinskey.